Reduced Delivery Time: Journals are air freighted from our addresses in the US and UK on a weekly basis minimizing transit time. 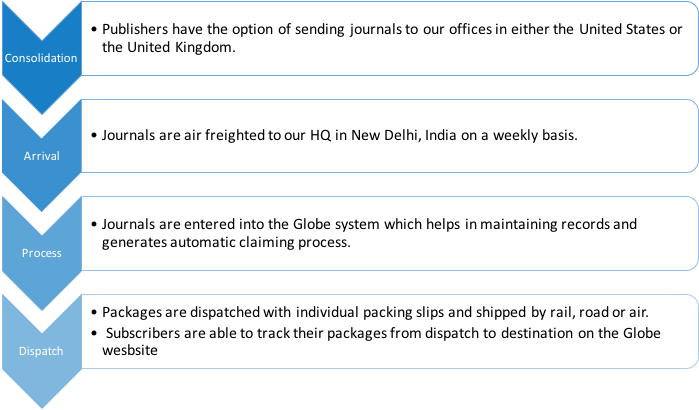 The journals are safely delivered to subscribers within 20-25 days after they are received to our UK/US addresses. Reduced Claims: Our process eliminates a number of intermediaries reducing the chances of loss as well delivery time. In our experience, we have found this reduces the claims by as much as 80%. Claims Handling: Delivery of issues are recorded in our system that enables us to filter through any false claims and only forward the genuine ones to our publishers. Assured Deliveries: Issues sent to the subscribers can be conveniently traced online anywhere in between starting right from our office to its destination. We insist our subscribers to acknowledge the receipt of journals and the acknowledgements are recorded for verification at a later stage if required. Maximum and timely renewals: The quantum of missing issues/non-received issues is a major criterion in the decision for renewals. Assured delivery means satisfied subscriber and subsequently better renewals. Regular renewal and reminders are sent to all the un-renewed clients on regular intervals, nonetheless.